People are turning to vanpools as a cheaper alternative to driving alone and a more flexible and direct travel option than taking a bus. 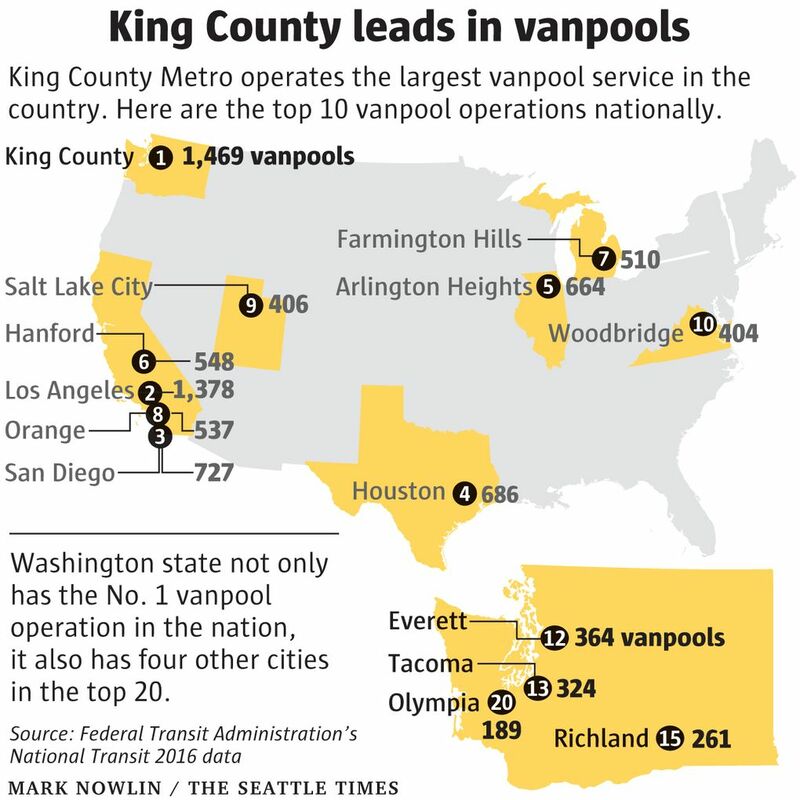 King County Metro operates the nation’s largest vanpool program, with more than 1,500 vans carrying commuters back and forth from work. When Kaiser Permanente acquired Group Health in 2017 and moved its operations from South Lake Union to Renton, Carolyn Glenn knew she had to make a change. Her commute from Ballard was going to be insufferable, increasing by two hours per day. But she didn’t want to leave the company. Instead, she gathered with co-workers around a map of Seattle’s neighborhoods traced on a whiteboard and dotted where she lived. How do I start a vanpool? It takes some effort to form a vanpool. Here’s what you have to do. 1. Find your vanpool mates. Vans require at least five participants, including the driver, and different-sized vans can hold as many as 15 people. RideshareOnline.com lets you connect with people interested in joining a group. 2. Calculate your fare and ask your employer about subsidies. 3. Decide on a route, pickup locations and a schedule. 4. Designate one person to be the primary driver, responsible for keeping the vehicle functioning, one person to be the backup driver, and another to be the bookkeeper to track mileage, ridership and fares. Metro approves participants based on their driving record. 5. Complete an application form and required driver training. 6. Retrieve the van from Metro. No direct bus route travels from Ballard to her office in Renton, and she didn’t want to drive alone every day. Glenn even thought about biking to work but eventually decided it wasn’t a sustainable alternative. So she and her neighbors who also work at Kaiser organized a vanpool through King County Metro, which launched the program in 1979. Glenn, an attorney at Kaiser, and her vanpool mates travel 40 miles a day between Renton and Ballard and, with a company subsidy covering fares, pay nothing. Nearly 1,500 vans run under Metro’s program, according to 2016 data from the Federal Transit Administration (FTA), making it the largest public vanpool operation in the nation. Scott Gutierrez, a spokesman for Metro, said that number has grown to more than 1,600 vans with over 10,000 participants in 2018. People are turning to vanpools as a cheaper alternative to driving alone and a more flexible and direct travel option than taking a bus. Metro encourages vanpooling in areas where buses don’t reach to reduce the number of solo-driven cars on the road. Here’s how it works: Metro charges each van a fare, based on the distance of the commute, the size of the van and the number of participants. The fare covers gas, maintenance, insurance, roadside assistance and an emergency ride home if the van breaks down. Fares are typically split among the participants; sometimes the bookkeeper and primary driver in the group will pay a little less than the others since they take on more of the work to organize and maintain the vanpool. Gutierrez said its 2018 vanpool operations budget is about $5 million. Fares cover 100 percent of the operations and capital costs of running the vans, so it’s a self-sustaining operation, he said. The Los Angeles County Metropolitan Transportation Authority runs the second largest vanpool operation, with 1,378 vanpools in 2016, behind Seattle, according to the FTA. Not surprisingly, the two cities also experience more traffic congestion than many other urban areas. San Diego was a more distant third, with 727 vanpools. Washington’s focus on reducing solo car commutes helps explain why the Seattle region leads the nation in vanpools, said Philip Winters, director of transportation demand management at the Center for Urban Transportation Research in Tampa, Florida. He cited the state’s 1991 Commute Trip Reduction law that requires major employers in urban areas to develop plans that encourage alternatives to driving alone to work. That’s one reason why Kaiser Permanente, and companies like it, subsidize the costs of a vanpool or an ORCA card. The Puget Sound region’s network of HOV lanes available to vanpools also contributes to the program’s success. Without access to lanes that provide a quicker commute, carpools and vanpools are still useful but their appeal is diminished. In 2005, Boeing moved 150 people working within its propulsion-systems division in Seattle to a new building in Everett. It was a big transition for the employees, so the aerospace company brought in people from local transportation agencies to meet with workers to discuss commuting alternatives. Boeing also allowed employees to use work time to complete training required to join a vanpool. Mary Lou Mikelsons, who lives in Renton, was among those relocated to Everett. She formed a vanpool with co-workers using Community Transit in Snohomish County, the 12th-largest public vanpool program in the nation. The vanpool saved her at least 30 minutes of travel time on an average day by using carpool lanes, she said. Flexibility is a big advantage vanpools have, Winters said. “The vans allow service to reach in much lower density areas or operate on a schedule where another form of transit may not adhere to. You can run them second, third shifts and not worry about having to operate a full-size bus,” he said. Mikelsons said out-of-pocket cost averaged between $75 to $150 per person each month. Boeing’s vanpool subsidy was a big incentive. The company initially offered participants $30 a month, and later upped the subsidy to $60 a month to encourage vanpool groups, she said. Gutierrez said an average vanpool participant is charged about $140 a month in fares. Monthly subsidies vary by employer but average around $85, he said. Microsoft offers its Puget Sound employees a $100 monthly subsidy that can be used to reduce vanpool fare. In 2016, Microsoft President Brad Smith said 42 percent of company workers used a form of transportation other than driving alone for their daily commute. 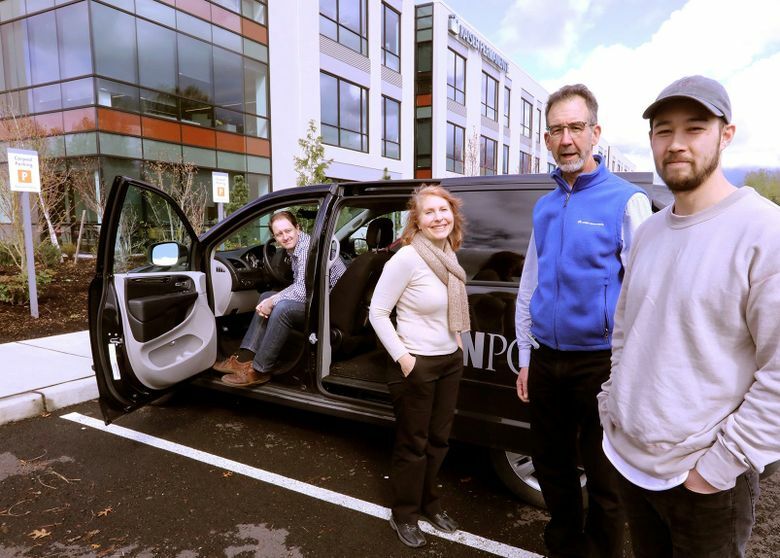 Chris Wiswell, who began a contracting job in 2000 for Microsoft at an office on Willows Road in Redmond, said financial support from the company was key to making a vanpool work. “They would pay our vanpool fare, and so all of our gas, maintenance and bridge tolls were then things that we didn’t have to pay for and that made it a really good arrangement,” said Wiswell, who lives in Seattle and no longer works at Microsoft. Companies have an added incentive to support vanpools as they can foster bonds between co-workers. “It’s a great, nonofficial environment for chit-chatting about work and how things are going,” Wiswell said. Transportation planners love to analyze a region’s “drive alone rate” — the percentage of solo commuters versus those who walk, bike, take transit or carpool. When the drive-alone rate for Seattle’s central core dropped to 25 percent last year, it was a cause for celebration. Fewer people driving alone means fewer cars on the road and that means less traffic. But reducing the drive-alone rate isn’t the only way to reduce congestion. Fifty of them drive alone, and 50 of them carpool — two people per car. The drive-alone rate is 50 percent and there are 75 cars on the road. Now move all those carpoolers into five-person vanpools. There are still 50 people driving alone, so the drive-alone rate remains at 50 percent. But instead of 75 cars on the road, now there are only 60. With five people per van, the vanpools have freed up a significant amount of road space, although it doesn’t show up in the stats. Buses and trains are, obviously, even better at freeing up road space. Most groups set strict schedules, so if you consistently run late in meetings, a vanpool might not be a good fit. Some companies offer subsidized Uber and Lyft rides in the event of an emergency, such a sick child or pet. Metro recommends that participants discuss agreed-upon behaviors and norms in the van. For example: Do you listen to music? Does the driver get to choose the radio station? Does the driver get to choose the route? What happens if someone is frequently late? It takes a commitment from all members to be prompt and communicate when running late, Wiswell said. He said he’s grateful he found a vanpooling option because those extra minutes saved from sitting in traffic added up and allowed him to get home faster.